Aston Martin is to make St Athan its "home of electrification" in a move that could create hundreds of jobs. 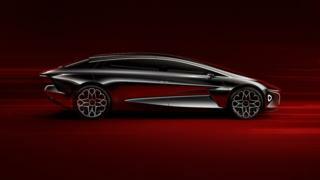 It will build its new Lagonda car at the Vale of Glamorgan site, which it describes as the world's first zero-emissions luxury vehicle. The company is already creating a significant presence at the former Ministry of Defence base, with its plant set to bring 750 jobs. When completed in 2020, its DBX luxury car will be handmade there. The site will now also become home for the Lagonda brand and Rapide E - its first battery-powered vehicle - when production starts in 2019. "Aston Martin sees itself as a future leader in the development of zero emission technologies, and I am delighted that St Athan will be our 'Home of Electrification' for both the Aston Martin and Lagonda brands," said the company's president Dr Andy Palmer. He added that the Rapide E will "spearhead" development of Aston Martin's low and zero-emission vehicle strategy. International trade secretary Dr Liam Fox said the move will create hundreds of skilled jobs while First Minister Carwyn Jones called it "a huge vote of confidence" in Wales. He added: " It is a genuine testament to the reputation, dedication and skills of our work force."